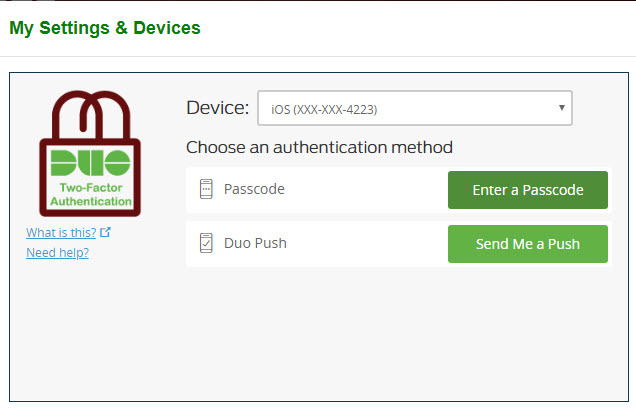 When you get a new mobile device (phone, iPad, etc) you will need to set it up on your Duo account. The following instructions will assist you in doing that. NOTE: If you have deleted the Duo app follow these steps. 1. Open a web browser on a computer and go to 2fa.msstate.edu. 2. Now click on Generate a Two-Factor Authentication Passcode. You will have to enter information at prompts after this (as shown). 3. After clicking Submit on the last screen you will be given a Passcode. This passcode will be good for24 hours. Please write your passcode down. After the passcode is written down please click Exit. 4. Now you will need to revisit 2fa.msstate.edu and click on Enroll in or Manage Two-Factor Authentication. 5. This will bring you to a prompt asking for a Duo Push or a Passcode.Click on Enter a Passcode. 6. After logging in with your 24 hour Passcode you will be taken to the following screen. 7. Click on Add/Manage Device and enter your passcode again on the screen below. 8. This will take you to your Settings & Devices. If you are reactivating a device, click on Device Options. If you are adding a new device, click on Add another device and skip step 8. 9. Click on Reactivate Duo Mobile. 10. Choose what type of phone that you have and then click Continue. 11. Install Duo Mobile for *your phone type*: If you do not already have Duo Mobile installed you must install it now. Then click on I have Duo Mobile installed.